Looking for a fun challenge? Grab your ISC stamps, and and play along with this month's challenge and you could win 1 FREE ISC stamp sheet of your choice! So, what's the challenge? Simply create a card using ISC Stamps and the sketch shown here, then leave a link on the ISC Blog Challenge Post with a link to your project by June 7, 2009, for your chance to win. For my card, I used the ISC plate Nature Silhouette II, stamping my flowers on White card stock in the following colors: Pink Pirouette, Baja Breeze, Kiwi Kiss and Tangerine Tango. I used the Oval Nestabilities and my Big Shot to cut the Oval, then layered the panel on a Scalloped Chocolate Chip Panel. 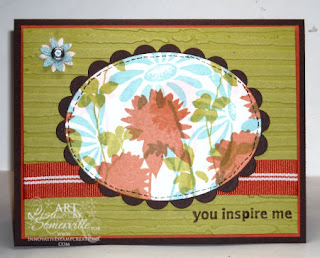 The sentiment is stamped on Kiwi Kiss card stock, then embossed using the Big Shot and the Distressed Stripes CuttleBug Folder. In place of the button, I added two Felt Flowers and a Rhinestone Brad. Save 10% on your ISC purchases through May 31, 2009, use coupon code isc509. This is so pretty, Lisa! Love the depth of the over stamped flowers. This is stunning, Lisa! Love the flowers in all the different colors...perfect for this sketch! Wow, Lisa, what a stunning card!!! I have to agree with Connie, the flowers in different colors is perfect on this card!!!! !